The WMH 2-3/8” OD Horizontal Tenon Wall Bracket is designed to mount Techlight light fixtures that are equipped with a 2AF Adjustable Knuckle onto a 2-⅜” OD horizontal tenon. The heavy duty wall bracket is constructed of 8” square aluminum plate. A 2-⅜” OD x 4” tall horizontal tenon is provided for fiixture mounting. 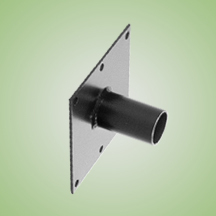 The 8” x 8” mounting plate has 6 bolt holes for secure mounting. Mounting hardward provided by others.